I have searched long and hard for a pitta! I am not a very good bird-watcher; I tend to get bored too easily if the bird does not appear right in front of me, sanding still for its photograph! Pittas are usually the least-likely bird to do this, they have to coaxed out of their jungle hiding places, usually using call-back. A friend and I searched hard for one in Khao Yai NP in Thailand, but we didn’t stand a chance, we did not use call-back (or call out it should be called!) and it was probably the wrong season anyway. 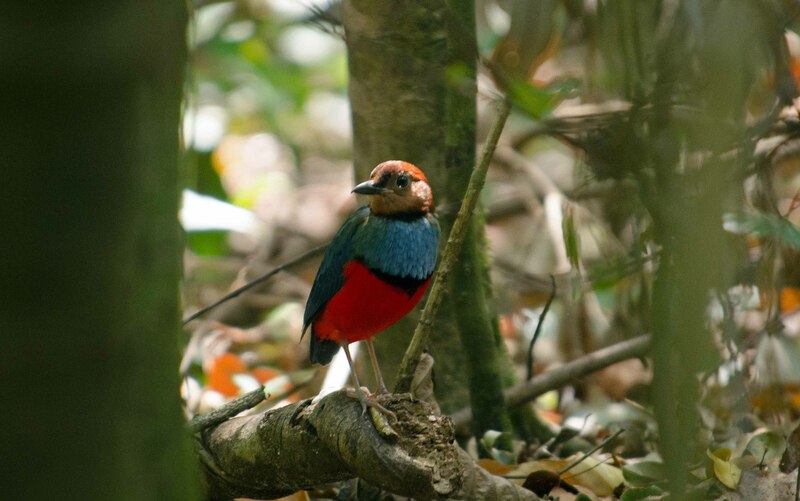 I came closest in India, but even a really good bird-watcher (our guide Craig Robson – who wrote the guide-book for Thailand and South East Asia) could not tempt it to come into view. We stood there for hours, or at least it seemed like it, waiting for the little bleeder to come into view. He (or she probably) didn’t. She just looked out at us silly humans, standing in a row, playing the call of the pitta. She was not fooled, and went back to whatever she was doing before we came along. I used to joke that pittas were made up! They were the most colourful and fantastic birds that anyone could imagine, and some unscrupulous but imaginative bird artist simply made them up – using all the colours in the palette. But they do exist, and someone even managed to see them all in one year! The tale of how he (Chris Gooddie) did this is a really good read; both funny and enlightening (1). But as this pitta expert reveals, they can be maddeningly difficult to see; they have the power to vanish into thin air, reappearing somewhere else, without seeming to move. They truly are conjuring artists. So it was with some trepidation and disbelief when my guide Esli, mentioned that he had spotted a pitta. There it was, standing right in front of us in Tangkoko Nature Reserve, Sulawesi. Even I could not fail to get a picture of it. It hopped around a little, but mostly just stood there – like it was waiting for something! 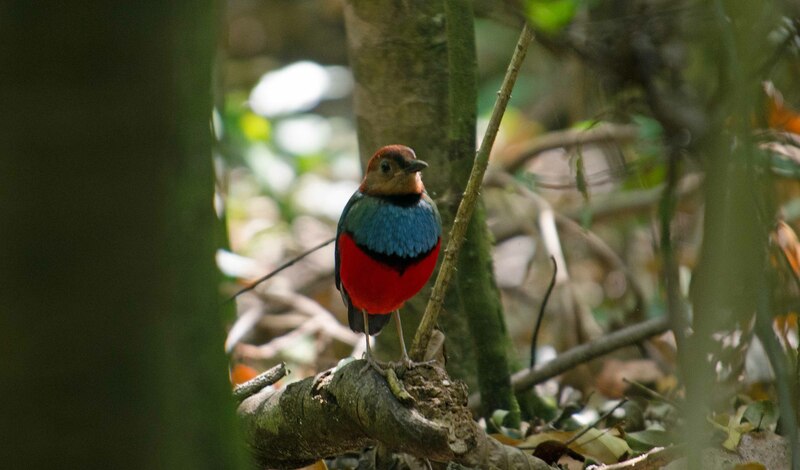 Red-bellied pittas (Pitta erythrogaster) are clearly not your average pitta; they have not heard that they need to be invisible; to make birders work really hard to see them! No, they just pop and stand there; proud of their lovely plumage, wanting to be admired. They are the exhibitionist of the pitta world! So there it was – pittas do exist! And I not only saw one, I managed to get a half-decent shot. Almost everyone does who visits to Tangkoko. Now, perhaps the jinx is broken and I can get to see some of the other 31 species present on the planet! Ray Cannon's nature notes Pity the poor pitta!